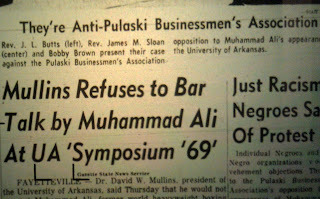 I happened to stumble on some old Arkansas Traveler newspapers a few months ago and among them were several papers about a controversy that arose in February 1969 about the scheduling of Muhammad Ali to speak at the University of Arkansas Symposium '69, a student-run lecture series. I recalled that I was an amused spectator and peripheral participant in the events attending the controversy, but did not remember the details or the outcome of the kerfuffle. 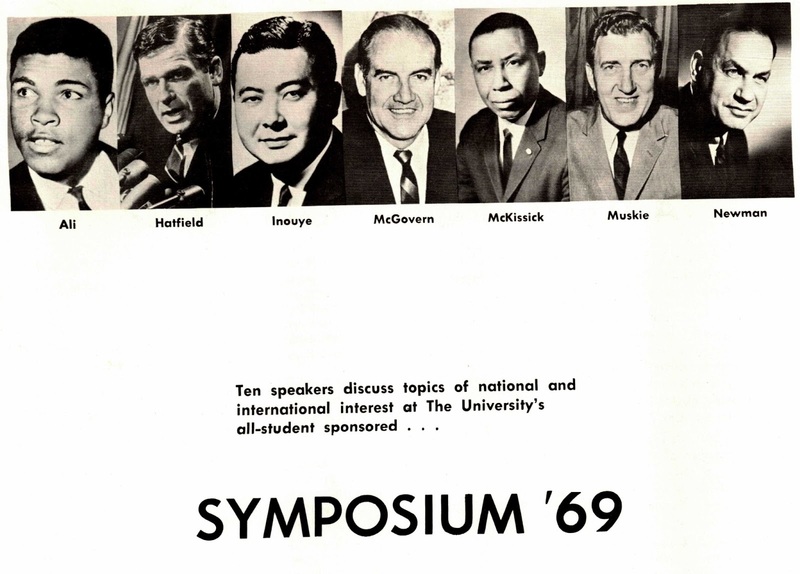 The controversy stated soon after a story was published on February 13, 1969 in the Arkansas Gazette providing information on the lineup of speakers for Symposium '69. In roughly a month, six senators, an NBC newspaper reporter, a NASA scientist, a civil rights activist, and former heavy weight champion Muhammad Ali were scheduled to appear on the UA campus..
Ali was available to speak at UA because he was no longer allowed to fight professionally and was making a living by lecturing on college campuses. He told a reporter that he was scheduled in 1969 to speak at 64 universities including Harvard, Yale, Princeton, Notre Dame, and UCLA (Arkansas Democrat, March 10, 1969, p. 2A). A few days later, on February 25, state Senator Milt Earnhart of Fort Smith introduced a resolution in the State Senate to condemn Ali’s upcoming appearance at the University of Arkansas. Earnhart had served in the state House of Representatives from 1958 through 1967, then had been elected to the state senate in 1968. 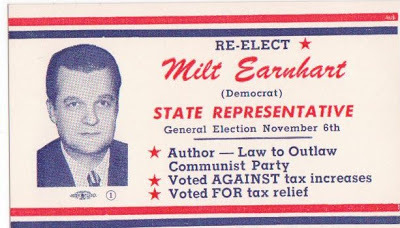 One of his campaign cards listed among his qualifications his introduction of a law to outlaw the communist party. This resolution came to the Senate floor on February 28. It did not go through unchallenged. 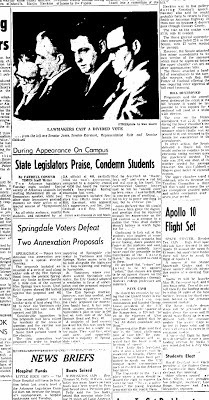 Debate of the resolution, according to the Gazette, was “one of the lustiest oratorical exhibitions of the session.” (Arkansas Gazette, March 1, 1969, p. 11A) After Earnhart stated objections to Ali’s appearance because he was a draft dodger and had nothing of value to tell students, state Senator W. D. Moore of El Dorado stood up to argue that the resolution opposed the concept of free speech. He told the Senate: “I detest Cassius Clay as an individual…but students had the right to expose themselves to Clay’s thought.” He said it was wrong to graduate students from the University without allowing them to be exposed to both sides of questions. He asserted that the Senate would be doing an injustice if it caused cancellation of Clay’s speech. “Are we indoctrinating them?” Sprick asked. “You are not letting them hear the other side,” Moore said and Sprick replied that there was only one side. In addition to Sen. Moore, two other state senators spoke against the resolution. One was the only Republican in the state Senate, Sen. Jim Caldwell of Rogers, a Church of Christ minister. The other was Sen. Clifton Wade of Fayetteville, who represented the county in which UA is located. In one exchange, Sen. Chambers asked Sen. Wade if he realized that riots always follow such college appearances. Wade said that was incorrect. After the Senate resolution passed, a few letters about the controversy -- all but one pro-Ali -- were published in the Gazette and Democrat. Also, apparently some local veterans and civic organizations in different Arkansas cities passed resolutions against Ali's speech. However, it is not clear what most Arkansas thought -- if anything -- about the planned speech. The Ali matter gained some more visibility on the UA campus on March 12, the day of the speech when two letters about it were published in the Arkansas Traveler. One letter, from Sen. Milt Earnhart, was a response to a letter that had been sent by a group to students to Sen. Earnhart after he had introduced his anti-Ali resolution. These students, from Fort Smith, wrote to oppose the resolution. 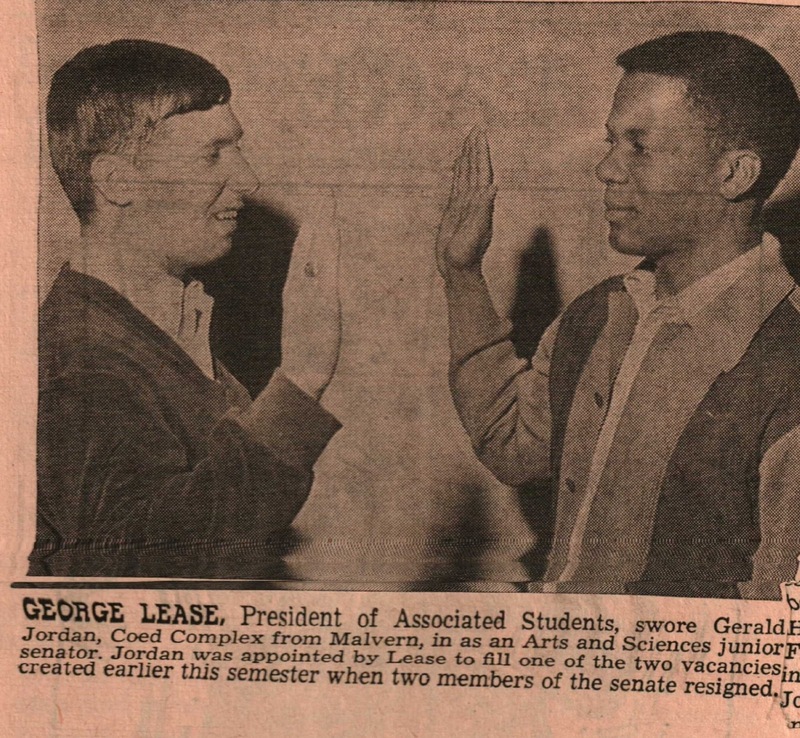 He addressed his reply to George Lease, the elected president of the student government who grew up in Fort Smith, even though Lease had not signed it. Lease responded to Earnhart’s letter by sharply rebuking him for sending a copy of the letter to Lease’s ailing mother even though he, Lease, was 22 years old and self-supporting. He asked Earnhart if he sent copies of letters to the parents of everyone with whom he corresponded. 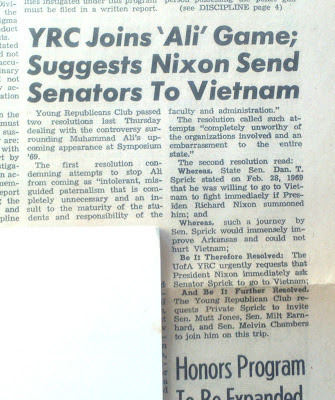 In a deft move, Lease refused to respond the Earnhart’s assertions, instead inviting him to speak, along with other state senators, at a special session of Symposium ‘69. He proposed dates for the appearance and offered to pay expenses and an appropriate honorarium. Muhammad Ali and Floyd McKissick made their speeches as scheduled on the evening of March 12th to a full house at the Barnhill Field House. 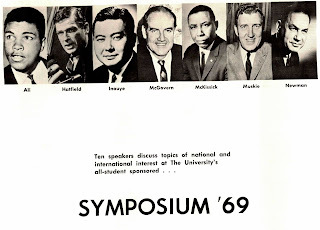 The crowd was about 4,000 people, including several hundred blacks, the largest attendance at a Symposium ’69 event. 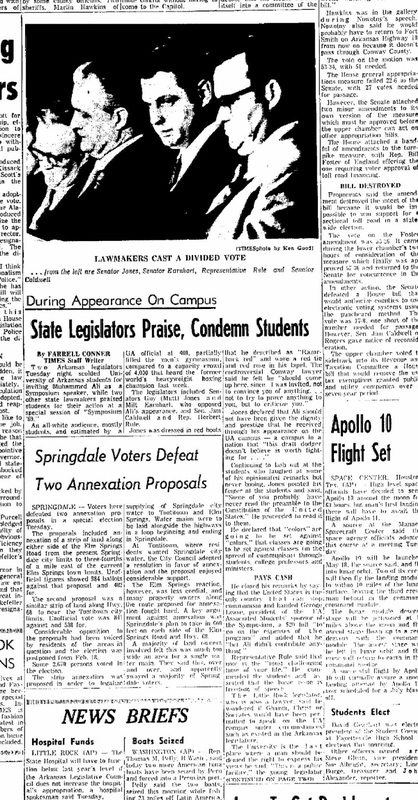 When the speaker was not advocating separation of the races, he was praising George Wallace to the skies, both of which stands seem to accord with the plurality of voting opinion in the state. One wonders again what the advance fuss was all about. (Arkansas Gazette, March 20, 1969, p. 6A. 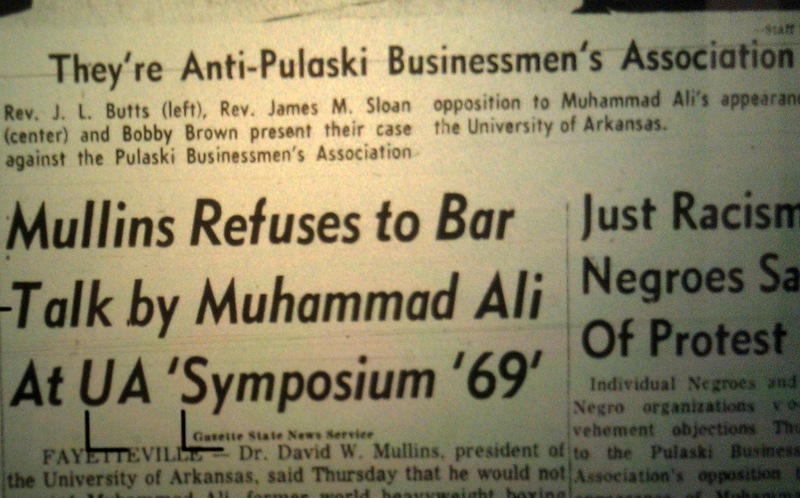 Six days after the Ali speech, three state senators and a state respresentative traveled to the University of Arkansas to take part in a special session of Symposium '69. Two of the speakers, Sen. Guy "Mutt" Jones and Milt Earnhart came to explain why Ali should not have been allowed to speak on the UA campus. Sen. Jim Caldwell of Rogers, the only Republican in the state senate, and Rep. Herbert Rule of Little Rock came to defend his appearance. Sen.Earnhart spoke first, suggesting that students “talk to some of the people in your hometowns and see the reaction of these people who support this university, who are paying taxes and the [income tax] surcharge and then see it paid over to a draft dodger. He said, “This is not a matter of questions of free speech or race.” He asked, “What are you trying to do? Are you trying to disturb your parents and the people of Arkansas?” He concluded, “Well, you are.” (Northwest Arkansas Times, March 19, 1969, pp. 1-2; this story is re-printed in appendix 2 of the Scribd document). Jones linked Ali to communism. He said, “The Chinese say they are going to take over the world and the Russians say they are going to take us from within. They say they are going to do it through college students and through professors.” He also told the audience that if there is a last citadel of Christianity, it is this country. He asserted that no power on earth can stop the spreading of communism except the United States government. His speech elicited a few cheers and some jeers. Sen. Jim Caldwell of Rogers, the sole Republican in the state Senate, told the audience that he was happy that Ali came to UA. He said, “I don’t agree with him, but he should be heard.” He argued that Ali had as much right to be heard as Mutt Jones. 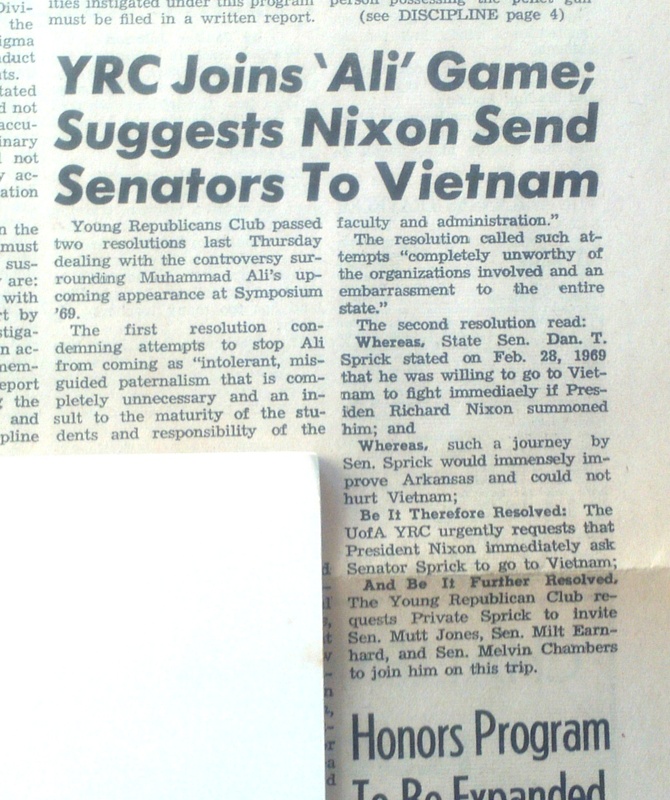 And Be It Further Resolved: The Young Republican Club requests Private Sprick to invite Sen. Mutt Jones, Sen. Milt Earnhart, and Sen. Melvin Chambers join him on this trip. I have to admit that I was pleased to note that stories about the Sprick were published in the Arkansas Gazette (March 7, 1969, p. 8A) and on the front page of the Arkansas Traveler (March 10, 1969). Before the lecture Tuesday, several students handed out leaflets saying “Our special thanks are extended to Guy (Mutt) Jones of Conway (the Athens of Arkansas) and Milt Earnhart of Fort Smith for attempting to insure our intellectual pureness and virginity. We miscreants who wrote and distributed this leaflet were, instead of being embarrassed by their juvenile actions, pleased that it got covered in the Gazette and newspapers. We were especially tickled that the leaflets seemed to upset Sen. Jones. Looking back at the Ali controversy more than forty years later, it seems that this incident can best be viewed as evidence of the changes taking place in the nation and Arkansas as the Sixties ended. Journalist John Starr (1987, p 55) described Winthrop Rockefeller as the “wrecking bar voters used to dismantle the political machine that held Arkansas in thrall and was threatening in the mid-1960s to give the state a governor for life.” In 1969, the wrecking bar was still at work: Rockefeller had defeated segregationist Jim Johnson in 1966 and Old Guard politician Marion Crank in 1968, and he brought forward what Ernie Dumas (2012), long-time political reporter, called “the most ambitious program in Arkansas history.” According to Dumas, Rockefeller said that this program was what he entered politics to do. The Old Guard Democrats wanted none of Rockefeller’s proposed tax (almost $100 million per year increase) and modernization program, which included, among other things, a reorganization of state government and the implementation of the state’s first classification and pay plan. 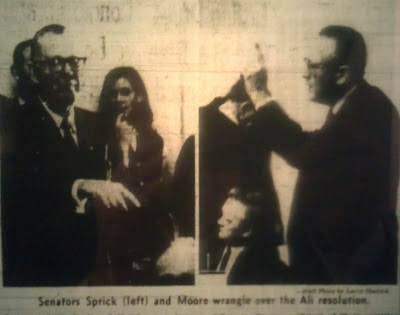 As the Ali controversy arose, they – under the leadership of Sen. Jones – were fighting to derail WR’s proposals, and were succeeding. Perhaps their success in thwarting Rockefeller’s program reminded the Old Guard of the old days when they could get their way on most issues. Perhaps in opposing the Ali speech, the Old Guard senators were just reverting to form, recalling how they had previously restricted speech on state campuses. In the late 1950s and early 1960s, they had used accusations of subversion and communism to limit who could speak on Arkansas campuses, keeping out people they labeled “racial agitators,” “communists,” and other bad “outside influences.” During those years, the Attorney General and legislators had held hearings on and conducted investigations of “subversives” they claimed were undermining order in the state. Because most funding for public universities came from state appropriations, college leaders tried to avoid offending the elected officials who proposed and voted on their budgets. From 1954 to 1966, Faubus and his men determined how much money Arkansas universities and colleges would receive each year, thus the Old Guard had been in a strong position to influence decisions about who was allowed to speak on college campuses. In 1969, however, the Old Guard senators no longer had the power to exert their will on Arkansas colleges and universities, though they tried with the Ali controversy. Both university administrators and students were less willing to submit to the efforts of these legislators to control them. Thus, UA President Mullins could ignore the state Senate’s anti-Ali resolution, and students could ridicule its authors, with little fear of the retribution that likely would have been meted out a few years earlier. Although, the Old Guard succeeded in killing most of Rockefeller’s reform program during his last term, the end of their influence was near. The major elements of Rockefeller’s program were passed in the following years under the leadership of the three progressive Democratic governors who followed Rockefeller in office. These three governors acknowledged that Rockefeller was “the beacon who showed us the way out of the dark days of politics.” (Blair and Barth, p. 46). The Ali controversy likely did not hasten the end of the dark days of Arkansas politics, but it did show the end was near.